← Design Council’s ‘Spark’ opens for 2017 applications. Dr. Thomas Margoni and Dr. Giulia Dore report on their ESRC IAA-funded public event, “Enabling Open Science through Open Access Licences” during CREATe’s IP Summer Summit. CREATe’s first IP Summer Summit (CIPSS’17) gave the unique opportunity to meet and discuss Open Science with speakers with different expertise, including academic, practitioners, governmental and non-governmental bodies and civil society, from all over the world. 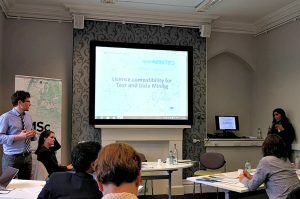 On 28th June, a public event titled Enabling Open Science through Open Access Licences, chaired by Dr. Thomas Margoni, illustrated the results of a recent ESRC Impact Acceleration Grant (no. ES/M500471/1). The session, articulated in four main parts, introduced the audience to the complex issue of Open Access licensing and Open Science best practices and presented the results of the IAA project, namely an Open Science fact -sheet and an Open Access FAQ. Introducing the panel, Dr. Thomas Margoni opened by delivering From Open Access to Open Science, presenting the ESRC IAA grant on Open Science. 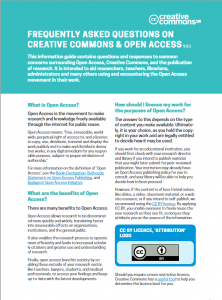 The panel displayed and distributed a first hard-copy version of the Open Science Fact-Sheet and the Open Access FAQs, designed by Thomas Margoni and Andrea Wallace to support researchers and the general public to better understand how to use Open Access licences, such as Creative Commons licences. The two documents aggregate useful information and concrete examples on how to best license data and publications in compliance with Open Science policies. 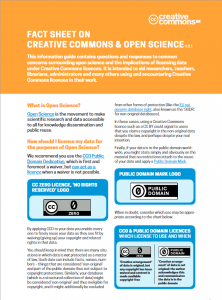 For example, the Open Science fact sheet recommends use of the waiver CC0 Public Domain Dedication for data instead of a CC BY 4.0: the latter, while one of the best drafted Open Science compliant licences for publications, may not be the best choice for data. At the same time, it recommends that other CC licences such as those including the Non Commercial (NC) and the Non Derivative (ND) clauses should not be used as they are not compatible with Open Science goals. Not only are they are not compliant with the Open Access Definition, but they create additional and unnecessary barriers to the circulation of scientific knowledge. The session was followed by the presentation of a set of licence compatibility tools, in particular the Licence Compatibility Matrix and the associated Legal Annotation Experiment. Developed by Thomas Margoni and Giulia Dore within the EU-funded OpenMinTeD project, the tools aim to resolve the issue of licence incompatibility with regard to Text and Data Mining in Open Science. The Open Science fact sheet and the FAQs have been developed thanks to the OpenMinTeD project and will benefit both an academic and a non-academic audience. The session was concluded by an introductory demo by Valerie McCutcheon, Research Information Manager of University Library at Glasgow, who actively collaborated in the development of the FAQs on Open Access and of the Open Access policies adopted and implemented by the University of Glasgow. Valerie’s presentation offered an overview of OA requirements prescribed by research funders including RCUK and Wellcome, and by the Research Excellence Framework (REF) system that assesses the quality of research in UK higher education institutions. The two documents will be actively updated and are licensed as CC BY 4.0. They encourage the transfer of knowledge into information that can easily be understood and used by the public, including practitioners, users, researchers, librarians, repository administrators, funders, governmental and non-governmental agencies and science foundations. We feel that, while the documents have just been published, they have proven to have already achieved this result.